There were tons of fashion during the latest episode of Pretty Little Liars! 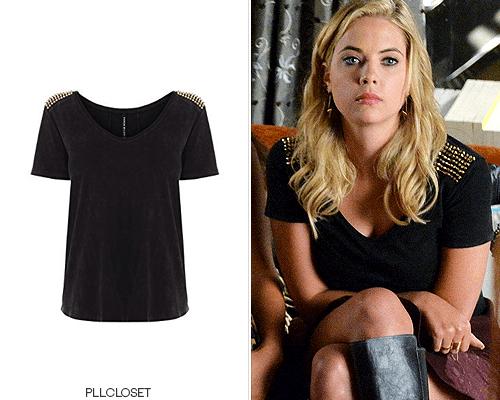 Naturally, I go straight to PLL Closet on Tumblr to find the outfit details from the girl’s looks this week! 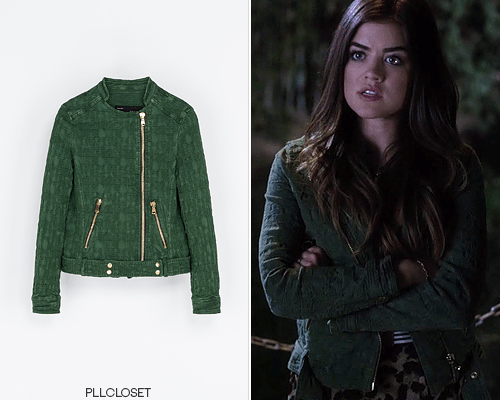 Thanks PLL Closet! Here were the pieces I liked the most! Karen Millen ‘Acid Wash Jersey T-Shirt’ – $64.95: I love a basic black shirt because I could wear it with anything! But the addition of the studs elevates the look and can still be worn with anything. Reverse ‘Leopard-Print Chiffon Maxi Dress’ in Brown Multi – $49.99: To be honest, I’m not a fan of leopard print, but I really liked this overall look for Aria. Remember when Aria wore crazy neons? Well, sometimes she still does, but this look is more of a “understated” Aria. She still makes it unique by pairing the dress with a striped belt and clutch. I love mixing prints and give her an A+ for the look! I also like her how natural her hair looks. Zara ‘Jacquard Jacket With Zips’ in Green – $79.99- I probably wouldn’t have worn a green jacket over the look above, but I still loved the jacket itself. The color is really pretty and the shape is super edgy! BDG ‘Twig High-Rise Button-Fly Jeans’ in True Black – $19.99: Out of all the girls, I probably dress most like Spencer. That’s probably why her high waisted jeans were by far my favorite piece from the episode. And they aren’t super expensive which is refreshing! Raquel Allegra ‘Pocket Tank’ in Army – no longer available: No longer available but it is a loose tank top that can be found elsewhere. I like a loose tank top and actually bought some over Christmas break because they were super cheap around the wintertime! I like this color on Emily too. She can really pull off the olive and plum tones well. « Follow T.J. Maxx on Instagram!